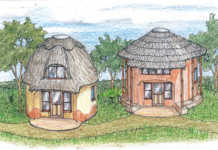 A four-bedroom homestead in Zimbabwe. We have just returned from our annual family holiday in Zimbabwe and because the family has grown, we need to have a homestead built on my parents’ plot. I have two siblings. All three of us are married and each couple has a child. In essence, we want to build a homestead that will cater for our annual holiday and at the same time, not be a big empty house when we are not around. Ideally, the concept should allow us to come together and enjoy family time as we only do this once a year. 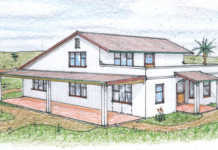 The ideal homestead must have a four-bedroom house – this would mean a main bedroom and three normal bedrooms. The lounge area must be linked to an open-plan kitchen. The living room is the key area, as we will be spending a lot of time in it, as well as on the veranda. The veranda can be extended in addition to the 200m² area. The total area available over the old existing house was 200m². 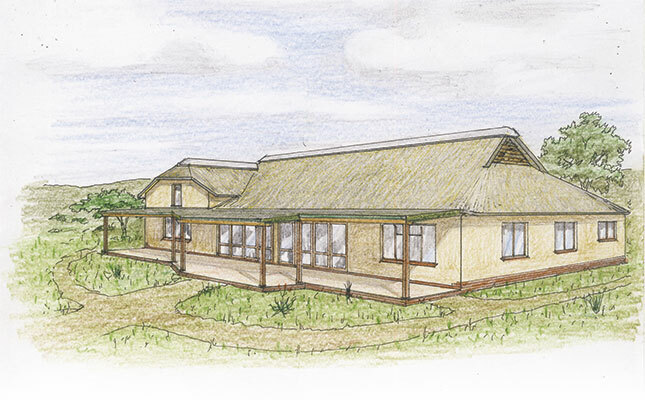 I have always loved thatched houses and there is an abundance of hyperenia/turpentine grass in the area which will definitely ease the construction costs. 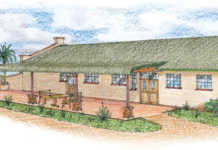 Thank you for the go-ahead on the plans for your new holiday home. On the floor plan, I’ve indicated the overall length and breadth of the building, as well as the furnishings to scale, so that you can see the functionality. I also thought of the possibility of the family growing, so I’ve raised the walls over the bedroom wing in order to create a dormer-sleeper room above, for when the kids get older and want their own space – definitely not the proverbial sardine can. With the styling being a thatch roof, the span over 10m means that the weight of the thatch would be quite heavy. The walls internally would have to be built to the underside of the thatching. The rafter poles would also be about 8,5m-long, if available in those lengths. I will, however, design the roofing timbers to be able to withstand the stresses and strains. Give me a call to discuss any further options.